The former Echuca Town Hall and Courthouse was built in 1869 to a Classical design by the Bendigo architects William C. Vahland and Robert Getzschmann, who were both German born. James Macintosh was the building contractor. The former Echuca Town Hall and Courthouse is a single-storey brick structure, comprising a simple hipped-roof central section flanked by lower wings with parapet walls and brick entablatures. One of these wings, fronting High Street, contains the main entrance and is articulated by a pediment. The first court house at Echuca had been built in 1858 as a Court of Petty Sessions. The new building was designed to serve the dual purposes of council chambers. 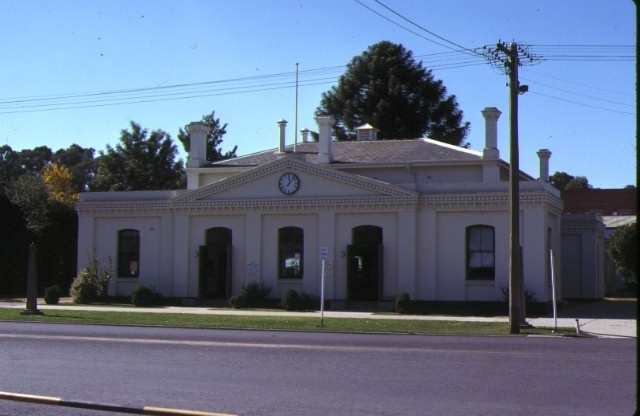 It accommodated the offices of the municipality of Echuca, which had been established in 1864, the same year that the Melbourne railway link was established. The port town grew significantly in the decades following this important development. Council sat here for the first time on 19 March 1869 and the local Court of Petty Sessions was heard in this building from 1869 to 1924. The combining of different public functions in this way was popular in the 1870s and 1880s because municipalities took advantage of the 99-year leases offered by the government on court houses reserves. 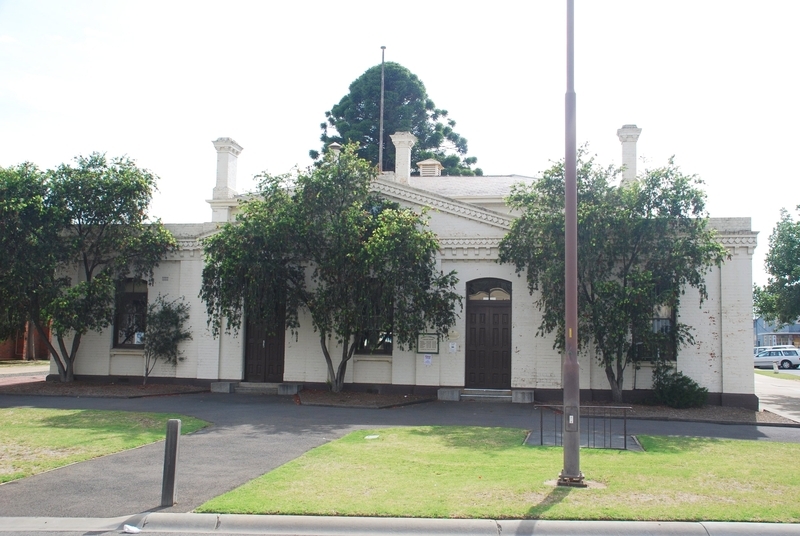 A second court house [H1469] was built in Echuca in 1876 to serve as a circuit court of the Supreme Court. The Former Echuca Town Hall and Courthouse was also briefly used from 1912 to accommodate the Echuca High School (a new high school building was built in c.1914). In 1954, it stopped being used as a town hall and was used as a municipal library; for some time until the mid-1970s the building was also used as a pre-school centre. 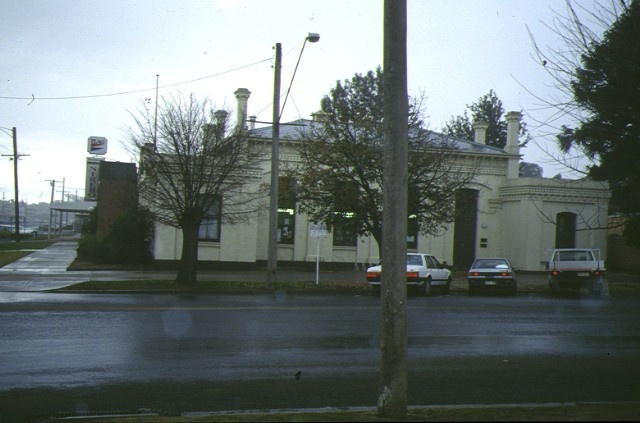 The former Echuca Town Hall and Courthouse is of historical and architectural significance to the State of Victoria. The former Echuca Town Hall and Courthouse is of architectural significance as an example of a Victorian civic building. It is significant as a distinctive early work of the prolific architects Vahland and Getzschmann and a notable example of the Classical style. The unusual form of the building, with exposed hall and flanking wings, and the low portico and brick entablatures are notable. The building is historically and architecturally significance as an early example of a combined town hall and courthouse building, which was a popular dual function for municipal buildings in Victoria in the 1870s and 1880s. 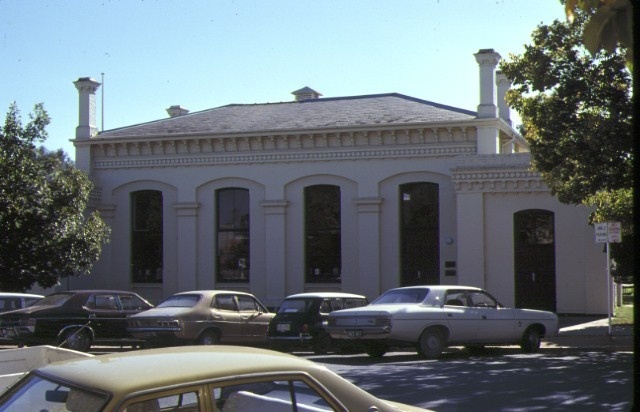 The former Echuca Town Hall is historically significant as a critical element of Echuca's historic precinct. It demonstrates an important relationship with the other elements within this precinct, including the Echuca Wharf (1867) and adjacent Shackell's Bond Store (1859) [H558], which are amongst Echuca's oldest riverfront buildings. It is an essential element of high streetscape and a fine feature of the historic city of Echuca. The former Echuca Town Hall is of historical significance for representing a significant period of growth of this river port town after 1864, fuelled by the rail link to Melbourne and the goldfields, where there was a ready market for Echuca's river trade. The building also represents a period of extensive civic-building in Victorian country towns during the second half of the 1800s. City of Echuca. No. 145B. Former Town Hall, 524-528 High Street, Echuca. Register Number 145B now becomes Register Number 378. Erected in 1869-70 and also once served as the court of petty sessions. The architects were Vahland and Getzschmann, the contractor was J Macintosh. The single storey brick structure comprises a simple hipped roof central section flanked by lower wings with parapet walls and brick entablatures. One of there wings, facing high street, contains main entrance and is articulated by a pediment. Building is now a library. Court House data sheets held HV– ‘Echuca’. Australian Heritage Commission. Register of the National Estate. Citation. Doyle, Helen, ‘Dispensing Justice: A historical report on the theme of justice in Victoria’, prepared for Historic Places Branch, DNRE, 2000. O’Neill, Frances, ‘The Visible State’, MA in Public History thesis, Monash University, 1993. Andrew C. Ward & Associates, ‘City of Echuca Heritage Conservation Study’ (1992).